Polishology: Zoya Kelly - and 300 Followers! First off, I want say - Thank You!! Polishology reached 300 followers the other day, and I am ecstatic! I really appreciate all of you taking the time to look at my blog! I have plans in the works for a multi-prize 300 follower giveaway, as a thank you to all of you, so stay tuned! Now on to the gorgeous Zoya Kelly. I was thrilled with this polish - it is a dark slate gray creme, with just enough of a hint of blue to make it really interesting. It applied very well, two coats and super smooth, no complaints on application. A fabulous fall and winter color! Here are some pictures of Kelly on its own. I decided to add a simple design with this one, a double flower stamp from Konad plate m37. I thought that the white contrasted nicely with the dark gray. I topped it off with a coat of Deborah Lippmann Addicted To Speed, my new favorite topcoat! I wore this for three and a half days with only minimal wear. This is a gorgeous color that I would highly recommend adding to your collection! I still have yet to meet a Zoya polish I don't like... I can't wait to try my three free from last week, which arrived yesterday! I plan on making another order soon, when the spring collection comes out (more on this soon). 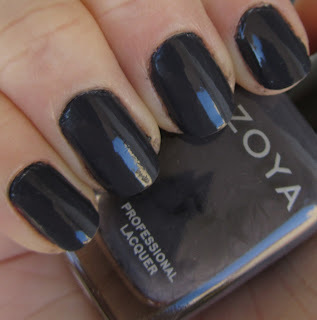 What is your favorite Zoya polish?